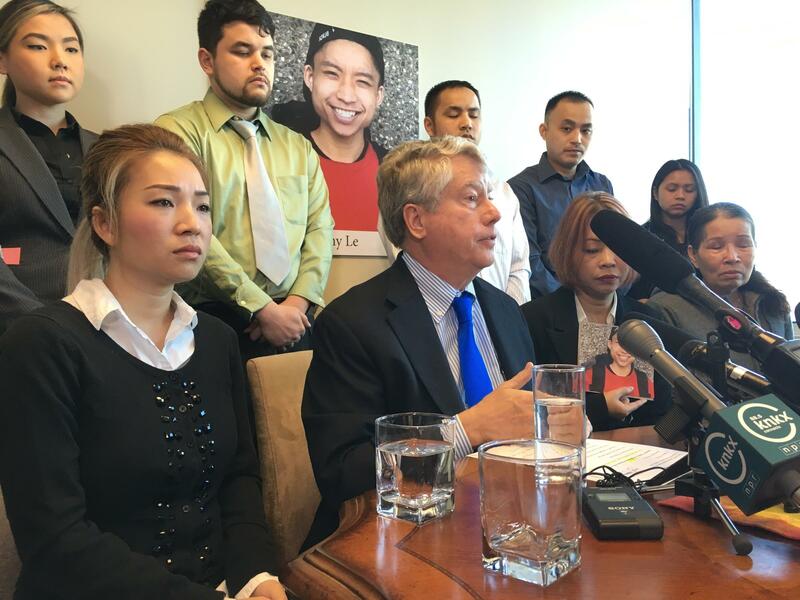 Family of Tommy Le, who was killed by a King County Deputy, join attorney Jeff Campiche (center) in announcing their lawsuit over the death. Seattle attorney Jeff Campiche says the family was devastated when a King County detective came to their home to tell them Le was dead. When they were told how he died, they couldn’t believe it. After all, Le didn't have a criminal record or a history of violence. Deputies had responded to 911 calls of a man pounding on doors and wielding a knife. "The detective said that Tommy was shot by the Sheriff’s deputies because he was lunging at them with a knife,” Campiche said. It came out later that Le didn’t have a knife. Rather, detectives said they found a black ballpoint pen at the scene. And the autopsy showed Le had been shot twice in the back and once in the back of the hand. Campiche says the family was left with lots of questions the King County Sheriff’s office still hasn’t answered. In the civil rights lawsuit filed in U.S. District Court in Seattle, the family contends the deputies weren’t adequately trained to deal with someone in a mental health crisis, which Le may have been. The family also believes race was a factor. They say a white kid in a wealthy neighborhood would not have faced the same fate as Le, whose family immigrated from Vietnam. Surrounded by his siblings, cousins and mother, Le’s grandmother, Kim Tuyet Le, talked about her love for her grandson and explained why holding officials accountable for his death is so important to her. “I just want to seek some justice for him so that he can rest in peace," she said through an interpreter. The King County Prosecutor’s office, which is handling the case, declined to comment on the lawsuit against the King County Sheriff's office.